Sadie Green created a business called Green Starfish. This is an up and coming business. Not only is it selling ties to students at Davis High, but it’s helping families get out of poverty. Green Starfish was started by an assignment in an entrepreneur class at the school. The assignment was just supposed to be a theoretical, but Sadie went above and beyond to create her business. Sadie decided that it would be a good idea to sell ties, because prom season is coming up, and ties are about to become a very needed product throughout the school. Green Starfish is also helping families in get out of poverty. The business is specifically helping a family in Guatemala called the Garcia family. The family is close friends with Sadie Green’s family, the father’s of both families met on their missions and stayed in touch ever since. Right now Emilio (the father of the Garcia family) is struggling with his health, so the main goal of the company is to help his kids with the money they are trying to gain. The poverty rate in Guatemala is growing, right now 23% of the people are in extreme poverty. 50% of profits go to getting people out of poverty. Nearing the end of the year, many seniors are looking for what they are going to do with their lives after high school. For many, this means college. Getting into college can be a stressful experience, because depending on where you go, you will be living there for however long you are attending the school. Another reason why choosing the right college for you is so important is because depending on how good of an education you get, it could determine the job you have and ultimately even decide where you live. These are huge things in your life. Every year, seniors feel this pressure and rightfully so. When going to college you have to take many things into consideration. Some of these things being who you are rooming with, where you are going to stay, what you are going to pay with, and many more things. Student Will Ferrin said, “its really hard to decide where to go.” this is the common theme for many students because, like stated earlier, this is one of the decisions that shapes many of the things in your life. In conclusion, even though it seems daunting and scary to decide where you are going to college… it is an awesome decision that will shape your life for better or for worse. Since the yearbook doesn’t do it, DHS News has decided to throw together a list of “Most likely to”s for the graduating seniors. We have created a list of 16 categories with three guys and three girls nominated for each category. Here’s your chance to vote for the people you think deserve to be the definitive “Most likely to” for that category. This year, the Davis school district has decided to give a writing test to both sophomores and freshman to see how well our students improve in writing. The Davis school district is the only district in the state to choose this format, this year. The writing test used to be a part of the sage testing, and was for many years, until they decided to switch. The same people that run the ACT, run this writing test. Now that there is a mandatory writing section in the ACT the school decided to use their format to help students, hoping it will help them prepare for the written ACT test later. The ACT version is hand written, but this written test, like the old sage test, is on the computer. The test is either an argumentative essay or an informative one. Each student is given the same passage, and with the information given they will either choose a side or produce information from what is given. This essay is designed to be a 3-6 paragraph essay, depending on the format. These tests are being taken during the English class of each students, so as to not disturb the schedule of the school like The ACT does. Some of last week and part of this week are when it is being taken, so as all of the students finish it up, the school will learn how well their kids are learning, hoping that one year of English will make it better. I am pretty sure that it will, but you never know. Every few years artists find new ways to coax fans into their music, leading a revolution of change in the music industry. An industry that will go to the depths of someones mind, and haunt the artists that find those catchy sounds and trends. Leading them to decide whether or not they want to descend the down whirl spiral of fame. We live in an age where the theme of trans-realism has seeped within modern day arts and utilized by experienced and upcoming music artists. Trans-realism is the movement in where people want to escape reality due to abnormally high depression rates, arts use science fiction and fantastical elements to give a feelings of beings lost within an alternate reality. Which means anything from drug use to burring your face into a self phone could be considered as such. Artists who have become popular over the years all have something in common. Artists that stick out, tend to travel lands untouched by the music industry. They develop a controversial image by talking about taboo topics and unearthing the uncomfortable. As well as drawing the listener into an alternate reality using those unique sounds and tones. These sounds and tones are not always from the norm’ but is what keeps you coming back for more. Each decade has had artists follow this criteria. Leading the psychedelic movement in the 60’s was The Grateful Dead. This group sang popular songs like “Box of Rain”, “Friend of the Devil”, “Uncle Johns Bands’, and “Touch of Grey”. Although the sounds within the songs were recognized by most, songs like “Fire On the Mountain”, “Dark Star”, and “Unbroken Chain” gave fans a taste of what music could be. While being consumed by the chimes from”Unbroken Chain”, surrounded by products of Woodstock 69, and an agent from the psychedelic world gave people the ability to fully travel into that different reality. Following the 70’s came bands like The Doors and Pink Floyd. Each explored their own sounds and men like Jim Moresen found that the strange shouldn’t always be shunned. As The Doors whaled on the organ creating songs like “The End” and “People of Strange” it gave an eerie feeling of the shadows of society. However Pink Floyd used sounds of the world in songs like “Breathe (Air)” and “Money”. The whirls of wind added into the back ground and the clanking of money and cash registers allowed fans to relate to their music, to their modern lives. As the 80’s were coming to the end, rock, pop, and white pants were just not cutting it for some and a new form of music had begun to pry its way into musical culture. Without knowing it, the rap group N.W.A changed musical culture forever. Songs like “Straight Outta Compton”, exposed the dark truth of growing up in Compton and places like it. As many listened in dis-belief, the harsh language and bluntness used in their music angered many. For most were not ready to accept the controversy of the outside world. Generations passed and the world became more accustom as generations pass. Legends like Curt Cobain and the rest of Nirvana came out with songs like “Smells Like Teen Spirit” that went along the lines of teenage life. Discussing teenage years during the grunge age. Artists like Kid Cudi dug deep into their self conscious to give us beats from another world. A great example is Travis Scott. His brand new album, “Astroworld” allows you to take a ride in a torn down amusement park in Texas. Music has changed throughout the years but in some ways has stayed the same. The beauty of the matter, is music can take you away from reality. You can get lost within distant memories tied to the artists music and find clarity in the world we live in. The Bread and Cheese Club is hosting an art show on Wednesday, April 10th. The show will display all of the work that the members of the club have created throughout the year. Bread and cheese will be provided at the event. The club has been a place for artists of different mediums to come together and collaborate on a variety of projects. Pieces of art will be on display for people to come see. Some of the mediums that will be featured include paintings, ceramics, and music. Any student is welcome to bring art to display at the event, or to send a photo or video of their art to breadandcheese.davis@gmail.com to have displayed at the event, regardless of their involvement with the club prior to the art show. Though admission is free, donations will be collected for the International Child Art Foundation. The club has been collecting donations all year, and this art show will be the last opportunity to gather cash for foundation this year. With meetings twice weekly for the last six months, the Bread and Cheese Club has been preparing for this event since the very beginning. This art show marks the end of the club for the year. One of the pieces of art that will be featured at the show is the short film “The Gambler’s Fallacy”. Various members of the club had the opportunity to share their diverse talents during the making of this film. The 24 minute film will have its premiere at the end of the art show on Wednesday. The small club is hoping for a good turnout. This is a chance for the hardworking artists to show off their talents and a way for them to celebrate the end of the club. Plus, it’s free food and entertainment. What more could you want? One of the most anticipated events of the year here at Davis High School is happening this Thursday, March 21. The students and parents of the Davis High community have the wonderful opportunity to hear from special guests who are willing to come to our school and help us learn more about one of the most pivotal times in our country’s history: the Civil Rights Movement. We are so lucky to be able to have the chance to hold this assembly each year and enrich our lives by seeing first hand what it was like for African American citizens growing up and living in the United States during the Civil Rights Movement. This year Davis High has the amazing opportunity to hear from two incredible women, Dr. Valda Montgomery and Janice Kelsey, Devery Anderson, who is the author of: “Emmet Till, the Murder that Shocked the World and Propelled the Civil Rights Movement, and the Hill Air Force Base Baptist Choir. This is not an assembly you will want to miss. Valda Montgomery lived in Birmingham, Alabama in the 1950s and ’60s, where her parents owned the only African American owned pharmacy in town. In their home they held several civil rights meetings where Dr. Martin Luther King was in attendance, and helped hide freedom riders and other African Americans from hate groups such as the KKK. Janice Kelsey was a teenager when Martin Luther King called for the Children’s March in Birmingham in 1963. The day of the march she snuck out of her high school with her brother and ended up getting arrested for her participation in the march. We are very privileged to be able to have assemblies like these at Davis High school, and all students are encouraged to attend. ——- Ms. Leedy, one of the History teachers here at Davis who helps organize this assembly. You will not want to miss out on what these speakers have prepared to share with our school, so come to the assembly on Thursday!! Gym Classes: Harmful or Helpful? A recent study brings us to a conclusion that children that are physically “fit” obtain information more effectively than children that are found “out of shape”. This study brings a big discussion across the globe and in America about whether or not including Physical Education in the class schedules of students. Specialists and even parents have noticed that physical activities help young people to improve on attention skills, both at school and at home. A representative study, presented last May at the American College of Sports Medicine, found that fourth and fifth grade students who ran around and otherwise exercised hardly for at least 10 minutes before a math test scored higher than children who had sat quietly before the exam. The gym classes opportunities can vary a lot. Since school districts cover a big variety of students, it is a responsibility of theirs to offer as many options as they can, including adding team conditioning classes for students involved with specific sports and give them the credit for it, because it was proved that those were good for personal development. ” I think involvement in sports provides the students to socially develop and to work as a team, something that a lot of people don’t develop once they grow.”, said Travis Frey, the basketball assistant coach. Spring is almost here and that means that the fashion world is changing. So pack away your snow boots and knit sweaters, it’s time to get out your shorts and sandals. Here is what’s happening in the fashion world at Davis. One of the trendiest looks this spring, is pairing tight clothing with loose clothing in an outfit. For example, you could wear a form fitting top with some high waisted, loose jeans and some sandals. You could also wear a baggy t-shirt french tucked into some high waisted shorts with some Converse. Another thing many girls are wearing this spring are rompers. Rompers are an easy and cute option for an outfit. They also come in many different styles. You can choose one with shorts or pants or one with sleeves or no sleeves. You can conform any romper to your personality by choosing a style, color, or pattern. Animal print is coming back in style and many girls are choosing to couple their prints with bright and bold colors. For a swim day, you could wear a bright, vermilion bikini with denim shorts and a opened, button-down, animal print shirt. An outfit you could use for a simple date night would be a flowing dress with flower print and some sandals. You could pair this with a light denim jacket or some cute tights. So the next time you girls go out shopping, keep these trends and outfit ideas in mind. Fill up your closet with bright colors, animal prints, and flowing clothes and you will be following all the latest fashion. Let’s spring up Davis! The season of asking and answering to prom is in full swing, and many of our google search histories might have something to do with “creative ways to ask to a dance” etc. The pressure to be creative and memorable when asking to a dance can be a lot to some who prefer simplicity, while others go above and beyond with how they ask (or answer) someone to a dance. If you prefer to keep it simple, you might consider asking or answering your date face to face with no extra fuss. However for those who prefer the classic “make a poster and doorbell ditch them” method, here are some helpful tips. Make sure you get the right house. Reasons being self explanatory. Unless being caught is part of your plan, make sure you know your escape route and be careful not to trip while you run away. Have someone with you. Going by yourself is stressful, and everything is more fun when you have a friend. Also provides the benefit of a getaway car. Don’t overdo it. Of course, make it as extra as you want, but don’t let it be too stressful. Dances are meant to be fun, so don’t take yourself so seriously that you can’t enjoy the experience. Be creative. Everyone loves a good pun, and if they don’t, why are you going to a dance with them? What it all comes down to is that dances should be fun, even the asking and answering part of them. So don’t freak yourself out too much, just enjoy the experience and roll with the punches. With spring right around the corner, and the weather getting warmer, boys are starting to transition from their winter closet to their spring closet. As boys bring an end to wearing jeans and hoodies they are beginning to move towards something more comfortable and cooler. During the winter, the colder weather outside brings boys to try and find that middle ground between being warm and comfortable as well as being stylish. Most boys were wearing something with longer sleeves and a little more layers such as a hoodie, a flannel, or even just a long sleeve shirt. When it comes to pants, the 2 typical pairs worn were jeans or just a basic pair of sweats; there are also always those kids that wear shorts year round no matter the weather. Starting from the bottom, the main shoes being worn are a basic pair of runners whether they’re Nike, Adidas, or puma. Another pair of shoes are in the rotation for many are Vans, most likely because there are so many different styles and they’re able to be dressed up or dressed down and still look good. Next up is a style that’s been trending since the beginning of the 2017-2018 school year. Many kids are really liking the no socks look with the runners or with the vans, mainly because whether you wear runners or vans the no socks look enhances the combo with shorts or even jeans. No show socks are a really popular way of doing so, although on the topic of socks there are still kids that like to wear the classic pair of white Nike socks. With the way Utah’s weather is it’s always a good idea to keep the winter and summer closets open at all times. Pants are the main article of clothing that are constantly in rotation for boys. When the warm weather comes around many like to change into shorts, but there always the kids that like to stay in jeans year round. This is the time of year when a hoodie or jacket becomes less of a necessity and more of a choice of style. Many will begin to wear long sleeves, and when it becomes warm enough to they will begin with short sleeves. School is indoor, though, so despite what the temperature is outside they will still wear a short sleeve shirt. The final article of clothing that is allowed at Davis is head wear. Although many at Davis choose not to wear anything up top, a popular style that many like are beanies. For those who like to wear something on their head that aren’t a fan of beanies, a flat brim or even a dad hat are a great alternative. Now, these aren’t all the styles that go around, but these are the style most begin sporting in the spring at Davis. Springs coming up so start closing up that winter closet and start jumping into something a little cooler and a little more comfortable. Egging, doorbell ditching, ways to make much more noise than needed, childish pranks, and adrenaline seeking are all things are quite often seen or heard of when teenagers are involved. We seem to have a knack for getting in trouble. We aren’t fully mentally developed, leading to ideas that quite often lead to trouble, pain, or damaged items. Mischief and curiosity are very common in a teenagers lives. There are explainable reason for that, and maybe bad ideas are a good thing. The prefrontal cortex of the brain is associated with decision making, which doesn’t finish maturing in females around 18, and in males around 22. This underdevelopment in the brain is probably the greatest factor of all for why we don’t always use our brains, leading us to do before thinking; leading us to do now, contemplate later. This underdeveloped prefrontal cortex also leads to a confidence of our abilities that may not be actually what we think they are. These reasons mixed with a lack of experience leads to mischief and risks that wouldn’t even be considered by most adults. Though these decisions aren’t the best, they lead to lessons that we can’t in school. Where the line should be drawn, to put on a helmet, what risks lead to more pain than pleasure, to be more humbled, empathy for others when we aren’t so young anymore, and other life lessons that can’t always be taught, but instead need to be experienced. So next time your kid or your neighbors do something that is not at all what they should be doing, or something that may be just be on the dumber side of things, just realize that we don’t always get what we are doing. Make sure we never cross a line that leads to life, property, or our bodies being risked, because some things can’t be reversed. When we get into trouble, remember not only that we actually weren’t thinking, that you were there too, nobody is perfect, but most importantly that we need those lectures and lessons that only you and life can give us. The Davis District transition fair is a venue hosted to assist special education students to help prepare for adult lives. When the event coordinators were asked if students with disabilities could be successful in life they said “Absolutely! We see it happen all the time!” It usually doesn’t just happen automatically though; it requires direct instruction, early planning, and consistent improvement. This idea must be an absolute fundamental belief of parents and educators: they can be successful and have great transition outcomes with the right training and support, and it is up to us to help guide them there. Our goal is not ‘just to get them graduated.’” they stress that people with disabilities more than have the ability to be successful. They list several famous people with disabilities that were more than successful like Albert Einstein, Tom Cruise, Walt Disney, Temple Grandin, Agatha Christie, John Denver, Winston Churchill, Charles Schwab, Vincent van Gogh, and many others. Transition planning is what will take place at the fair. It is a focus on helping students transition from high school to adult life, such as employment, college education, and independence. In Davis School District, transition planning on the IEP officially begins in 9th grade, but age-appropriate transition activities can be done by parents and teachers much earlier! Transition planning is done by the IEP team and should take into account the student’s strengths, interests, preferences, needs, and the family’s cultural values. They are providing those with disabilities the means to become successful and happy adults. The first step in Transition Planning it to conduct assessment. To help make informed decisions about necessary services. The assessments include surveys, observations, interviews, assignments, skills practices, etc. transition assessments give information about interests, strengths, and weaknesses, so that a person can make goals and a plan on how to accomplish them. Assessment is not just a hoop to jump through, it should be the driver for the rest of transition planning. There is no perfect assessment, just know what kind of information you want and find a way to obtain it. The first thing that they plan to prepare for is independent living. The skills a person needs to function independently in life, and may include such areas as cooking, transportation, budgeting, safety, technology, housing, time management, social, etc. The next step they take is employment. This step covers skills necessary for many levels of employment (i.e. competitive, self-, customized, supported, sheltered). These skills may be in areas such as career exploration and matching, applying, being on-time, following directions, associating with colleagues, etc. The final step they take are discussions of post secondary education. This covers skills and preparation needed to attend a variety of post-secondary education settings (universities, community colleges, technical school, military, etc.). These skills may be in areas such as choosing a major, class selection, assignment completion, test-taking, organization, study skills, etc. The transition fair will bring a number of agencies and organizations in the community to help students with disabilities through the transition process! They may provide a variety of services, including help with work skills, job placement, independent living, post-secondary education, funding, etc. However, their services are often based on specific eligibility rather than entitlement as part of a free appropriate public education. So, it becomes the student’s/parent’s responsibility to make contact and coordinate services with them. It is usually helpful to make this contact early (late jr. high or early high school) to help begin the process, especially if there is a waiting list. With student/parent written permission, some of these agencies may be invited to attend an IEP meeting for more information. The fair will take place on March fifth at the Weber state Davis campus at 5 PM and will end at 8 PM. This last weekend I had the opportunity to go on vacation. My family and I went to Disneyland, it was super fun. Before we went to Disney, we were able to go to UCLA and watch a basketball game. The campus is awesome and the weather was great too. The environment was crazy and it was super cool to be apart of a Bruins win. UCLA beat Oregon 90-83. After the game we drove to Anaheim. The traffic getting from place to place wasn’t horrible either, which in L.A. it usually is. The next few days we were at Disneyland. I went with my family, cousins, aunts and uncles, and grandparents. We went on a lot of rides in both Disney and California Adventure. Both parks are really fun, but both have a little different vibes about them. California Adventure has some great rides and so does Disney. Some of the favorites from California Adventure were Guardians of the Galaxy, Incredicoaster, and Toy Story. Some of the favorites from Disney were Splash Mountain, Matterhorn, and Indiana Jones. Disneyland is a great place to have fun and be with friends and family. All the rides were great. The weather was perfect and it is just a great place to be. Congratulations to all the Juniors! After years of being warned by teachers and parents, it finally happened, the ACT! This last week Wednesday the 20th, was the dreaded day of the big test. For 4 and a half hours they came and took the nation wide test. With only a 15 minute break with snacks given by the generosity of the teachers, cheese sticks and fruit snacks. All the sophomores and seniors didn’t have to come to school that day. Seniors celebrating that they will never have to take that test again and sophomores terrified of the day next year that they will have to take it. A few weeks ago the school did give the opportunity for a free practice ACT, being able to get the scores back. Also there are classes after school, and online programs to prepare. So we would all be able to have a fighting chance to get into collage. 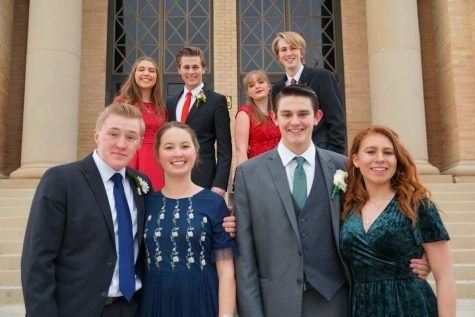 Six students from Davis High are finalists in the Deseret News Sterling Scholar competition. That’s twice as many as last year. These finalists are David Randall, McKenna Tracy, Emily Alvord, Charles Johnson, Nicole Svagr, and, well, me. So that’s pretty cool. Sterling Scholar has been a competition of the best and brightest students of Utah for over 50 years. In that time, Davis High has only had two winners, but they have had several runners-up. It is an honor to participate in this prestigious event. There are fourteen categories of Sterling Scholars. The categories that Davis will be representing at finals this year are computer technology, dance, family and consumer science, mathematics, foreign languages, and English. The competition focuses on four qualifications: academics, service, leadership, and the category of that participant. The four qualifications are weighted equally. In short, Sterling Scholar measures the overall merit of your work in high school and judges you accordingly. The people who win are generally the kind of people who have adopted a kid, started an orphanage, and wrote three books, while getting a 4.0 GPA and a 36 on the ACT (clearly hyperbole, but you get the idea). The idea behind the competition was to honor students that don’t get the attention that student athletes receive. An argument could be made that times have changed since then, and academics are just as recognized as sports now, but the competition remains. The reward varies based on the college the student is going to, but the prestige of participating in a competition like this is enough for most of the students involved. The first stage of becoming a Sterling Scholar is getting chosen at the school level. It varies from school to school, but here at Davis, this means filling out an application indicating your qualifications for the award. If you’re chosen, you then fill out an extensive portfolio. This thing is tough. You document everything that you’ve done in high school that may be relevant to the competition. Transcripts and ACT scores go on there. You add things that demonstrate your ability in your category. Lots of pictures are involved. Not to mention roughly seven essay questions. Once portfolios are submitted, 15 students per category are selected to move to semi-finals. You go to Ben Lomond High School and have an interview with a panel of 3 judges. The interview accounts for 40% of the final score. Then, five students per category are selected to move to finals. That’s where we are now. Like semi-finals, this is an interview. This time it’s down at Cottonwood High. The major difference is, now there are 2 more regions that you’re competing with for a total of 15 students per student across the Wasatch Front. The finalists don’t find out about how they did until a couple weeks later at an awards ceremony at the Conference Center in Salt Lake. The winner for each category and two runners-up will be announced. In years past, all the finalists get medals. It’s been a crazy ride and I’m so happy to have been part of it. I’m honored to have had my name listed with the other finalists. It has been an incredible experience. In every high school worldwide there are many cliques through out, and Davis High School is no exception. On a day to day basis the individuals interact with the others in their clique, and rarely interact with individuals outside of the clique they would be considered a part of. The hard part is determining what clique you would be put into. There are many cliques but there are 6 in particular that are largely seen above others. Out of all the cliques, probably the most common and high up with their social status would be the jocks. These are the kids that play for the high schools sports teams and usually have little other interests outside of their sports. Although, there’s many different sub-groups within this clique but they are all considered a part of the same clique. Another one of the most common cliques are the dancers. These range anywhere from the D’ettes to the Cheerleaders. They’re the stereotypical pretty girls that all the girls want to be friends with and all the guys want to date. The different groups typically do not all hang together but within their certain groups they’re very tight knit. Next up are the intellects. There are many different types, and regardless of the type of smarts they have they’re usually a pretty close group of kids. A more commonly used term for this clique would be “nerds” which may be seen as rude, but that’s how the world usually categorizes this group. They’re the kids that get the 4.0’s and the brown tutorial papers. The skaters are also among one of the most common cliques as well this group of kids don’t typically go outside of their group when it comes to social interaction. They’re one of the most tight knit groups when it comes down to it because there aren’t multiple groups within this clique. Artists are probably the most spread out clique because there are so many different kinds of art that are done within. From paint brushes, to pencils, to ceramics there are so many different kinds of art that go on at Davis High. The last group are really an unclassified group that we’ll call the “outcasts,” they usually just keep to themselves and live their day to day academic lives uninterrupted. This clique is the most spread out because there are so many different groups among them. Although there are many more than just these 6, those are the most common cliques of Davis High. It may be hard to identify what clique you are a part of, and it may be easy, but regardless, everyone is a part of this school of diverse personalities. Although everyone looked amazing, the bottom line was that the Best Dressed group was obvious to see as soon as they walked through the doors. Every part of each of their outfits were on point; their ties and dresses coordinated perfectly, their huge smiles let everyone know what a good time they were having, and the chemistry between each couple. 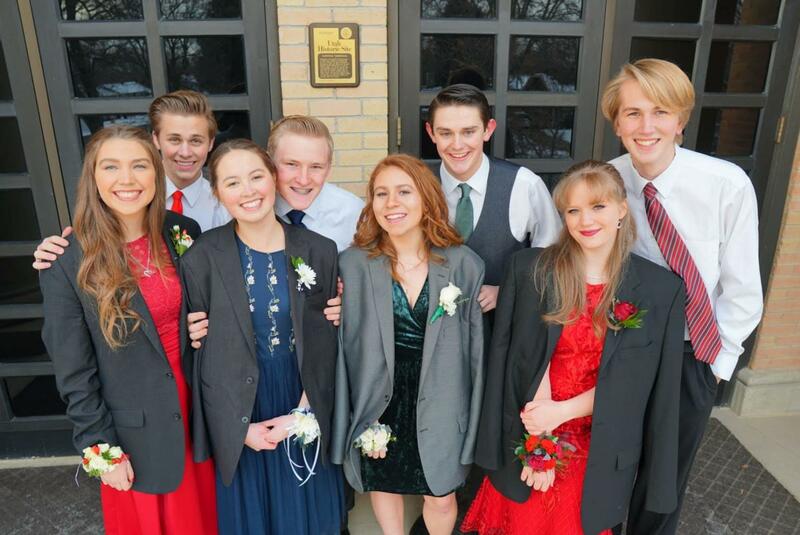 Logan, Tyler, and Lucas all went for black suits while Hyrum opted for a silver suit and vest to better compliment Tessa’s emerald crushed velvet dress. Lucas’ striped tie was a nice deviant from Tyler’s solid red tie. Ashlyn hit us with her classic red lip once again to match her red dress. DHS dances are a blast! Our next dance is Junior Prom at the state Capital on April 27th. Make sure to put it on your calendars and don’t miss out on all the fun a Davis High dance has to offer! P.S make sure to ask a date from amazing Davis High! Number 1, make sure to study consistently before you take it, even if it’s a couple days before the test. Just be sure to look over the material and study it. The second tip is to be ready for it. Whether that is just getting a good nights’ sleep before or eating a good breakfast. During the test “be quick but don’t hurry”, a famous quote by the greatest coach of all time…John Wooden. Basically this just means you got to be steady but not in too big of a rush to get through all the questions on the test. These tips should somewhat be of help for the test. Good luck! Will speed dating save dateless Davis? The senior committee officers (SCOs) at Davis High School put on the February senior activity of speed dating. All seniors were invited to go to the lunch room and speed date with other students. To get the conversation started they printed off questions on conversation hearts. Some of the questions include: “Would you rather live in the mountains or by the beach?” and “what’s your favorite show on Netflix?” They sit across from another student and ask a question to start a conversation and talk for two minutes then switch. The atmosphere was easygoing with good music and valentines candy at the tables, the perfect recipe for a good time. Most people are aware of the infamous reputation of “dateless Davis” a nickname as dark as the lights in the school. Putting together an activity that creates a stress free atmosphere to get to know others is a great way to break the dateless curse. The SCOs thought February would be the perfect time for a speed dating activity as its the week of sweethearts and everyone is getting in a “lovey dovey spirit,” as Hailee Pett said. The SCOs made an easy and fun way for students to get to know each other better before they graduate and move on from high school. It’s an activity made for everyone to be included and have a good time. According to students who went the speed dating activity was a great way to spend their night and meet new people. “It was really fun! It was really fun to get to meet and learn about people.” says Ryan Anderson. The turnout was good and it seemed everyone had a great time talking with others. The senior speed dating activity was a big success with helping students meet each other. The SCOs had a great time planning and successfully putting on the senior dating activity and we can’t wait to see what they plan next. We are hoping for more good times and maybe even a few more dates for good, dear old dateless Davis. The Battle of the Bands competition is an exciting opportunity for Davis High students to share their musical talents with their classmates, and if they do well, display their talents at the state level. This competition is first held at the school level, and one band is chosen to compete at the region level from each school. The stakes for the region level competition are much higher. Each band performs in front of a panel of judges who determines the top three bands that will move on and achieve their ultimate goal: competing at the state level. Bands must perfect their appearance, performance, and songs if they want to do well enough to be chosen to compete at the state competition. Two Davis High Students were going to compete in Battle of the Bands, but decided not to. “We don’t have enough time right now to participate in this high stakes competition, and the pressure might be too much for us right now” said Will Ferrin. Will’s band mate Tate Gardner said they were considering entering Battle of the Bands because they “love the chemistry they have together on stage, and they would love to be able to share their music with others, but right now is just not the time”. The local competition will be held on January 30, 2019 here at Davis High School. As the seniors of DHS prepare to end their high school experience, another group is preparing to start theirs. On Monday, January 14, Davis High School held sophomore orientation, welcoming the incoming class to the school and showing them the opportunities available here at Davis High. The commons area was alive with the sound of hundreds of students and their parents as they milled around talking to clubs and teachers about their schedules for next year. Along with the incoming sophomores, a plethora of students were there to market a variety of clubs to the new students. The students had a chance to meet new teachers as well as talk to their peers about extra-curricular activities such as DECA, Interact Club, and Robotics Club. An assortment of free stuff was given to the incoming students as they visited with the different groups. T-shirts, candy, and cookies could be found around the commons. Before the freshman entered the school, they had a brief meeting in the auditorium. During that time, they watched a video made by the student body officers. It was a remarkably good turnout. Students flooded into the school in surprisingly large numbers. The freshman rushed around in order to fill a ticket with stickers that they could get from every booth. These tickets, when filled with stickers, could be entered in a drawing to win a fizz gift card supposedly. The freshman learned a lot about the classes that they can take next year, which will aid them as they fill out their registration. Overall the event can be considered a success, as a considerable amount of the incoming freshman were able to learn from the graduating seniors. Founded in 1888,Utah State University evolved from a small town college to a thriving research university respected aorund the world. Their mission is to be one of the naitons premier student centered land grant and space grant universities by fostering the principle that academics come first. By cultivating diversity of thought and culture and by serving the public through tlearning, discovery and engagement. Weber State University was founded in 1889, by an American fur trapper named John Henry Weber. In 1933, it was made a state junior college. The college outgrew it’s downtown campus after World War II, and overlooks Ogden and the Great Salt Lake. The full time tuition which is two semesters is $4892 for Utah Residents and $14,679 for out of state resients. Student fee’s are $948 for Utah residents and non utah residents. Books are $800 and the same for both as well. Room and Board for on campus housing is around $4,796-$9214 for both in state and out of state residents. UVU is an open admission institution with a commitment to student success. They focus on teaching students real world experiences. There are 39,931 students with an average class size of 23 students. 56 percent of students who attend this college work part time, and there are 46 certificate programs. For one resident hour the tuitiion and fees are $423 , and $1198 for non resident students. There is an admission fee of $35 dollars, readmission fee of $15 , international student admission fee $100 dollars, challenge credit fee is $5 per credit. Challenge credit form is $15 . Late Registration Fee is $45 per class and graduation late fee is $25 . Utah’s largest college with the most diversity would definitely go to Salt Lake Community College. There are more than 60,000 students on 10 campuses and online courses. There is a faculty to student ratio of 1:20 at this college which guarantee’s you get more personal attention from professionals. For one hour it is 190.50 for tuition and fees for Utah residents. Non- Residents it goes up to $538.50 with tuition and fees. They’re apprenticeships are about $113.25 for one hour. Additional credit hours are $141 for resident, $489.50 for non resident and apprenticeships are $70.50. International students have an additional $40 per semester. There is a $50 late payment fee charged to all student with unpaid tuition and fees. The Univeristy of Utah is #1 in Technology Venture Milken institute 2017. There is about 963 thousand square feet for research space on campus. It was founded in 1850, making it the oldest college in Utah. University of Utah is very commited to cutting edge research to enhance the life of people in local national and international communities. Although it does not show the full tuition status at the U, it does show the undergraduate fees for in state are 8197, and the out of state fees are 26022. “Our students are the leaders and problem solvers of the next generation. I hope we inspire our student to learn, and I hope that learning lead s to inspiration.” Said Kevin J Worthen, the President of Brigham Young University. Brigham young university was founded in 1875 by Brigham Young and Karl G. Maeser. The cost to do credit hours for 12 hours or more is 2810 for Latter day Saints and 5620 for Non latter day saints which shows that it’s a religious school. It teaches great values but also has stricter rules. New years just passed, and it is time for a new semester. You may be behind in some classes to finish off this part of the year or you may just be going to class just because you have to ether way you are getting ready for the new semester. lots of students are exited for the new semester to switch up their schedule and do something different than what they have been doing for the past 3 months. Some people have even finished some required credits so next semester they have a couple of home releases to go home and relax and catch up on some home work for other classes. But most students still have a full schedule to get all their required credits, and some people have done most of the required courses but have chosen to take college courses to get a head start to their college careers. Lots of people make new year’s resolutions to achieve during the new year but many seem to fail and not go through with what they said. This year if your new year’s resolution is to do better in school you should follow through with that because this year you should be able to get good grades and turn stuff in on time. Also, you should be prepared for anything in your classes next semester. I’ve personally had classes that I thought were going to be easy and turned out to be hard. Some hard classes sometime become the least of your concerns because you get caught up with a really hard class that sounded really easy. All in all, you should be prepared for the challenges that the new year and the new semester bring. you should also look for opportunity that can benefit your future like taking some CE or AP classes, so you can be closer to your associates degree before you graduate. So, have a great year and meet your goals! lots of people at Davis high are graduating this year and it is tradition to go on a trip after you graduate. whether it is just to Las Vegas or to somewhere in Europe, you should celebrate finishing 13+ years in school. staying in school for that long is very hard and very stressful so after you accomplish something as big as graduating high school you should treat yourself. we all have those time where you just want to give up and drop out of school, but if you are a senior you can at least see the light at the end of the tunnel, so you should finish and get high school out of your hair, so you can celebrate a big step in your life. for all of the work you go through in your past years of high school you should take a short break before you go to college and that is what the senior trip is for. you could probably convince your parents to fly you somewhere that you have always wanted to go because you can bring up that life come faster than you think and soon you will be too busy to do what you want to do. maybe you just want to take a month to relax and chill with your family, that’s really great too as long as you take a break from life stresses for a while because at the end of the year you are an adult and you will have to take on lots of responsibility’s. A great place to go for a while before you go to college is California because if you just chill and sit on the beach with some friends and watch the waves crash at your feet that will be therapeutic for you. While you sit there you will realize that you have no responsibility’s and can just have a free mind. Another great place is the Mediterranean, the views you have anywhere are breath taking and the whole atmosphere is really just a cool experience. If you do go somewhere really fun like the Mediterranean, you will have a very good and relaxing time but if you go to California you will also be really relaxed and ready to go to college. We all know the classic Disney movie “Mary Poppins,” it was a remarkable film that many people highly enjoyed. Mary Poppins has returned in a new and exciting film, starring Emily Blunt. This is a thrilling film that displays incredible animations for all viewers. It was recently released in December, and many of the viewers highly enjoyed it! On rotten tomatoes it was given a 69% of audience liked it, and a 78% for the tomato-meter. There were some negative comments, like: “This movie wasn’t entertaining” However majority of those comments were big fans of the first Mary Poppins- released in 1964. So if you are one of those fans, then there is a chance you may be left disappointed. Although there was negative views of this movie, there were also very positive feedback to this film. A huge portion of the audience highly enjoyed this movie. And from the previews, it looks like a highly enjoyable film. If you have not seen it yet, go out and see it. You might really enjoy it!